BioWare knows that you want to play The Old Republic without waiting for hours in a server queue and is working to fix this problem. 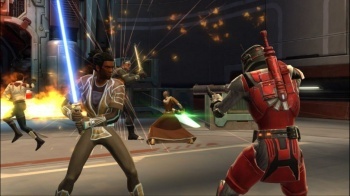 The launch for Bioware's Star Wars: The Old Republic could be going better. On one hand, millions of people are reportedly playing it right now. On the other hand, customers are complaining that they received copies of the game without the registration code - or, in some instances, are missing the game disc itself - and that some server queues are lasting multiple hours. Yesterday, BioWare promised to address the first issue, now it's promising to work on the server problem, too. "We know there have been questions about the queues on the servers, so we wanted to take a moment to give you some insight. In order to ensure that the service would be smooth and stable, we staged how we brought people into the Early Game Access program, adding people in waves. As you know, there are a lot of folks who want to play the game right now and we want to make sure they have lots of people to play with. Balancing this with figuring out when to bring new servers online to help alleviate the size of the queues is part art and part science. On one hand, you do not want people to wait too long - on the other hand, you want to make sure that people have a dynamic, engaging community to play with for long after launch. Either way, we have one clear objective - to make sure folks have fun. While we can't promise that there won't ever be queues, we can promise you that we are taking this matter seriously and constantly reviewing them to make sure that they are manageable and reasonable." While BioWare has acknowledged the problem and promised a solution, the developer hasn't revealed how many new servers it'll bring online or when it will do so. Hopefully the server queue problem doesn't dampen too many winter vacations in the meantime.